Denis Leslie West was educated at Chelmsford's grammar school and joined the R.A.F. soon after the outbreak of the war. He learned to fly in Canada and became a night-figher pilot. He married in January 1943. Eight months later he failed to return from a raid on Hanover when flying a Mosquito. His mother lived in Trinity Road. In the week of his wedding the announcement of the Distinguished Flying Cross to a former classmate of Denis' at King Edward VI's Grammar School, Laurie Osbon, was announced. By the autumn of 1943 Denis was serving as a Mosquito pilot in 264 Squadron, which undertook night intruder missions helping protect Bomber Command missions from enemy night fighters. On 27th September 1943 Denis failed to return from an overnight raid on Hannover in Germany in which 38 bombers and his fighter were lost. He was 23 years old. "MISSING NIGHT OF HANOVER. CHELMSFORD NIGHT FIGHTER. Flying-Officer Denis Leslie West, R.A.F., a night fighter-pilot, son of Mrs. G. J. West, of Caerlon, Trinity Road, Chelmsford, is officially reported missing from flying operations over enemy territory on Sept. 27, the night of the Hanover raid, from which it was announced that 38 bombers and one fighter did not return. 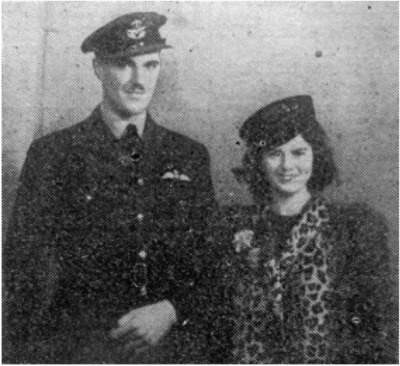 Flying-Officer West returned to his station from leave only the day before this operation. He is 23, and an old boy of King Edward VI. Grammar School. His wife, Mrs. Margaret West, was formerly nurse. They were married at Holy Trinity, Chelmsford, last January." Denis has no known grave and is commemorated by the Runnymede Memorial in Surrey. He left an estate valued at £304 3s. Denis was born in Hampshire in 1920, the son of the bootmaker Bertram Harry West (1883-1943) and Gertrude Jeanie West (nee Shrimpton) (1882-1959). His parents had married in 1904 and Denis had at least two siblings, Doris Gertrude West and Eric West, born in 1906 and 1909 respectively. Denis was educated at King Edward VI's Grammar School in Chelmsford. England as a sergeant-pilot (service number 119116) and was attached to a night fighter squadron, He received quick promotion, and after a period of operational duties was attached to a training unit as an instructor. On 23rd January 1943, when aged 22, Denis married Margaret Eunice Onslow of Liverpool at Holy Trinity Church in Springfield (pictured). She had been nursing in a hospital in Liverpool for more than four years. The best man was the Denis' cousin Philip Joslin, while the bride was given away by her sister Mrs. Joan Edwards. After a reception for 85 guests at the County Hotel in Chelmsford Denis and his wife left for honeymoon at Selsey-on-Sea in Sussex.